The worldwide prevalence of type 2 diabetes is reaching epidemic proportions. According to the International Diabetes Federation and other professional bodies, the global population of adults with diabetes (types 1 and 2) was approximately 415 million in 2015; that number is expected to rise to 642 million people by 2040. This trend is of grave concern to patients, healthcare providers, and governments. In addition to the direct burden of managing the disease, common and often catastrophic complications include cardiovascular disease, peripheral neuropathy, and blindness. Prompt diagnosis and effective treatment of diabetes are essential priorities for healthcare agencies and governments. The economic consequences of diabetes are also vast. Diabetes has high commercial significance to the suppliers of agents used in treatment of the disease and the devices needed for monitoring. The current diabetes market includes insulin and insulin delivery devices, various classes of oral hypoglycemic agents, and different types of instruments used for diagnosis and especially for monitoring the level of diabetic control. A new study by the Tufts Center for the Study of Drug Development reports that diabetes drug development is riskier compared with all drug development. Still, this already large market will grow in line with the increasing incidence of the disease and advances in diagnosis. The resulting market for diabetes therapies should reach $155 billion by 2021, from $125 billion in 2016, at a compound annual growth rate of 4.4%.The market for monitoring equipment and insulin delivery devices was approximately $18 billion in 2015 and is set to reach $29 billion by 2021. Oral hypoglycemic drugs comprise the largest product group, followed by insulin products (including administration devices), and then by monitoring devices and accessories. The global market for all insulins is estimated to have been worth $100 billion in 2015. US sales accounted for 23%, and sales in Europe for 24%. The insulin market is highly concentrated, with only three major suppliers: Eli Lilly, Novo Nordisk, and Sanofi. 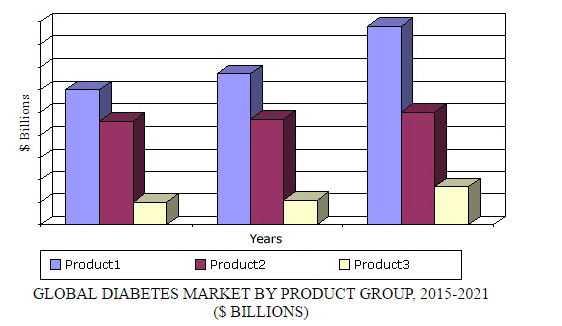 The diabetes market consists mainly of products used in the treatment of type 1 and type 2 diabetes. Type 1 diabetes is a lifelong autoimmune disease that currently must be treated with insulin. Type 2 diabetes typically appears in middle age and is linked to obesity; therefore, it is more prevalent in developed countries where populations tend to have relatively affluent lifestyles, sedentary occupations, and dietary overindulgence. “Until researchers achieve the goal of managing diabetes by tackling the underlying genetic and immunologic causal mechanisms, growth in this market is likely to be driven mainly by the increasing prevalence of both main types of diabetes, especially in developed and emerging economies, with incremental growth resulting from the introduction of improved versions of current drugs and devices,” says BCC Research analyst Paul Evers. ORAL INSULIN IS SOMEWHAT OF A "HOLY GRAIL"
Insulin is a hormone of large molecular size that has traditionally been given by subcutaneous injection; if taken orally in a conventional tablet or capsule, it is destroyed by gut enzymes. Other hypoglycemic drugs are usually capable of being taken orally, but some have inherently short half-lives that necessitate frequent dosing. More than 30 years after diabetics began injecting themselves with the modern form of insulin, delivery of this hormone in a pill seems as elusive as ever. Still, Novo Nordisk is reviewing its efforts to determine whether such a product can be commercially viable, and how much investment would be needed. Getting the right amount of insulin into a tablet is a formidable challenge; too much or too little can drive blood sugar to dangerous extremes. Novo Nordisk, which has sold injection-based drugs for nearly a century, has thus shifted its focus to an oral version of an experimental diabetes drug, semaglutide, which stimulates insulin production in the pancreas. Glucagon-like peptide-1 (GLP-1) hormones are produced and released into the blood by the intestine in response to food. GLP-1 increases the secretion of insulin from the pancreas, slows absorption of glucose from the gut, and reduces the action of glucagon. All three of these actions reduce levels of glucose in the blood. In addition, GLP-1 reduces appetite. Novo Nordisk’s semaglutide is a GLP-1 receptor agonist. It has proven effective in reducing the risk of heart attacks, strokes, and cardiovascular deaths in diabetics by 26%. An oral version of the drug could be available in 2020, according to Novo Nordisk’s chief science officer, Mads Krogsgaard Thomsen. Quoted in Bloomberg (9/19), Thomsen said, “Insulin is much more dangerous than GLP-1, and that means with oral insulin, getting the window right is not easy.’’ However, Novo Nordisk is not necessarily giving up on its ambitions for insulin in a pill. The company said in August that it would provide an update on its oral insulin program in the second half of the year. A recent study by BCC Research, Global Markets for Diabetes Therapeutics and Diagnostics, provides detailed market, technology, and industry analyses to help quantify and qualify the market for agents used in the treatment of diabetes, as well as the devices and instruments used for disease diagnosis and monitoring. Other factors evaluated include healthcare policies, demographic data, and the wider economic environment. Important global market trends are identified, and sales forecasts are provided by product categories and major regional markets through 2021.